Brownies are my go-to dessert. Fudgy chocolatey goodness. I can never pass it up! When browsing my pantry I noticed a can of Dulce de Leche. Have you tried that stuff?! Heaven. That is what it is. Heaven. Thats when it dawned on me to make a frosting to top my favorite brownie recipes. And thus this new fabulous dessert was born. Everyone who I served these brownies to could not stop RAVING about them! The Dulce de Leche-Chocoalte combo is incredible. These will be gone and devoured almost faster than they were made! 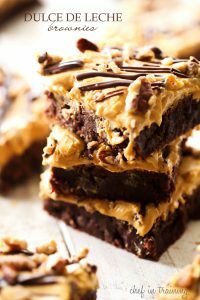 These brownies are so fudgy and delicious! The Dulce de Leche Frosting is the perfect compliment! In a medium bowl beat butter. Add powdered sugar and beat on low. Add Dulce de Leche, vanilla, and salt. Beat until creamy and smooth. Spread over cooled brownies. In a small bowl melt chocolate chips and shortning in microwave in 30 second incrimates until completely melted. Drizzle over frosting. I love dulce de leche and can only imagine how rich, decadent, and totally wonderful these were! I wish I could sample one right now :) Pinned! I have never seen a product in my grocery store labeled as "Dulce de Leche". Is there a particular brand? I know there is caramel syrup sold as an ice cream topping. Please help. Thanks. Do you have an int'l section at your grocery or a spanish section? You will definitrly find there! 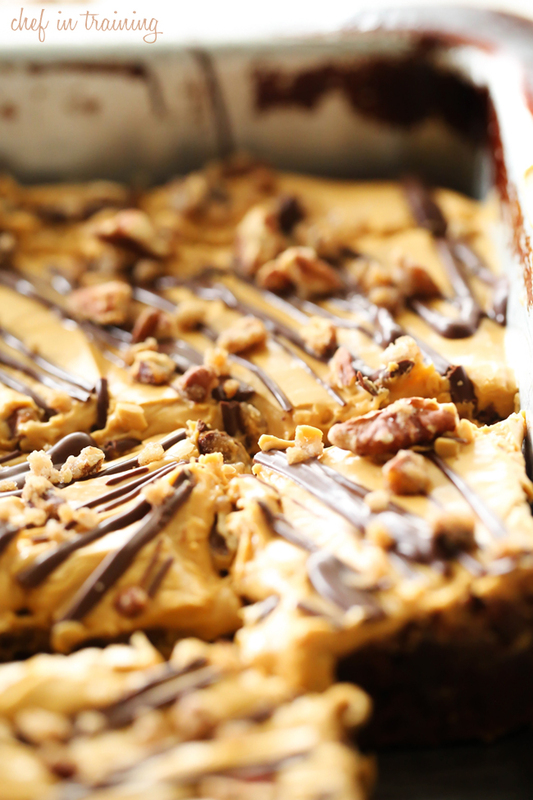 This recipe for DULCE DE LECHE BROWNIES sounds fablous. PLEASE COULD YOU TEL ME WHAT "Dulce de Leche " IS ? IT IS OBVIOUSLY A PREPARED SAUCE ? I AM FROM SOUTH AFRICA AND HAVE NOT HEARD OF THIS PRODUCT. Dulce de leche it's just heated milk and sugar. If you can't get some look a recipe up, it's pretty simple to make (just don't let it burn). Hi there.. You can make this at home simply boil a can of condence milk for about 6-7 hrs. The can should be covered in water. Keep pouring water so the can remain dipped in water otherwise the can may burst open.. Dont wory.. I have been making this since my high school days.. Nothing bad happened.. :) happy baking. Wow! I'm a little obsessed with Dulce de Leche now! Gorgeous brownies! I made these yesterday to take to a BBQ and brought home an empty pan. They were sooooo good.